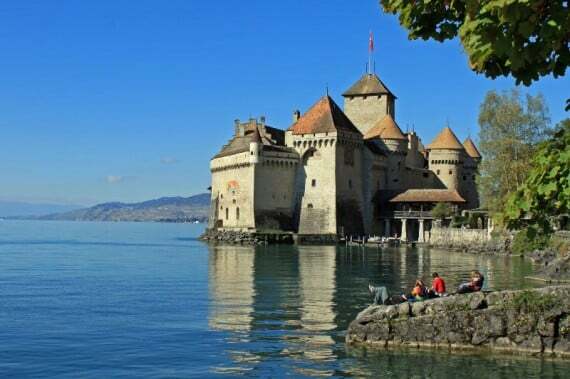 Chillon, Morges, Nyon, Rolle, La Tour-de-Peilz, and Yvoire are the best fortress-like castles (chateaux) to visit on Lake Geneva (Lac Léman) in Switzerland and France. 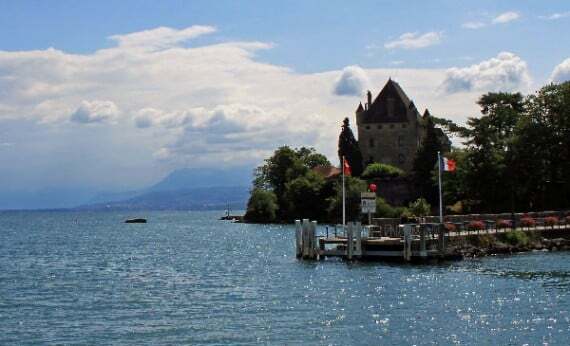 Several castles can be visited on the shores of Lake Geneva in Switzerland and France. The best castles to see are arguably the ones with a medieval history and a fortress-like appearance such as Chateau de Chillon, Morges, Nyon, Rolle, Yvoire, and La Tour-de-Peilz. All these castles are directly on the shores of Lake Geneva and most house museums that are open to the public. These castles are family-friendly and make great kids-friendly day-trip destinations from Geneva or Lausanne. 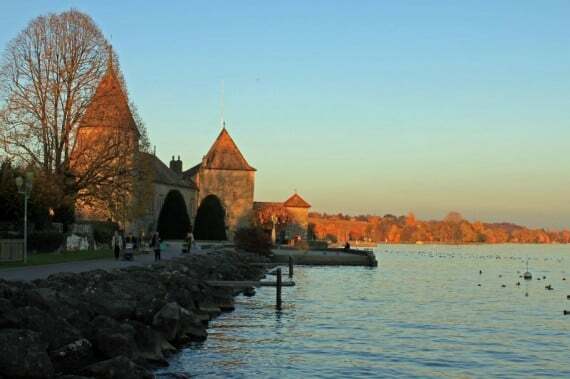 The Swiss Museum Pass is accepted in most chateaux and museums in the Lac Léman region. The French château can be used for both a castle that resemble a fortress and a castle that reminds more of a palace. Many, if not most, châteaux in the Lac Léman region are more palace than fortress. Even some such as Chateau de Coppet and Chateau de Prangins that may have a medieval origin, and some walls thick enough to withstand a few errant cannonballs, are presently more palatial than military stronghold. The châteaux in Chillon, Morges, Nyon, Rolle, Yvoire, and La Tour-de-Peilz are all very much fortresses at least in appearance. All were originally built by the House of Savoy and most were taken over by the Bernese in the sixteenth century but became part of Canton Vaud around two centuries ago. The Swiss Museum Pass is valid in almost all castles and museums in Switzerland (but not in Coppet!). Chateau de Chillon is easily the best castle to visit in the Lake Geneva region. This fortress on a small islet in Lac Léman near Montreux claims to be the most visited historic monument in Switzerland. It is easy to see why. The castle looks the part with thick walls, watch towers, a draw bridge, and dungeons. Visiting Chateau de Chillon is easy as the castle is open year round and tickets are available online. Chillon Castle is a pleasure to see in any weather making it also a good option for rainy days or when conditions for skiing are not optimal at nearby winter sport resorts in the Swiss and French Alps. Transportation to Chillon Castle is also easy from anywhere in the Lake Geneva region. See Visiting the Chateau de Chillon and Transportation to Chillon Castle for more details. Book Chillon Tours at GetYourGuide. Chateau de Nyon is well known for its characteristic white walls. The castle is perched on a small hill overlooking the waterfront of the Rive district of Nyon. 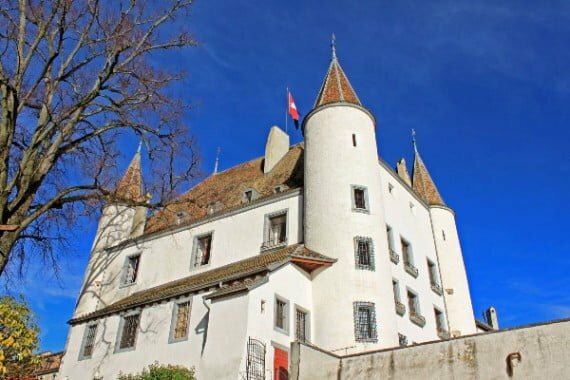 Nyon Castle houses the local history museum and a fine porcelain collection. The castle’s terrace offers some of the best views of Mt Blanc from anywhere in Switzerland. On clear days, it is also possible to see the Jet d’Eau in Geneva from here. 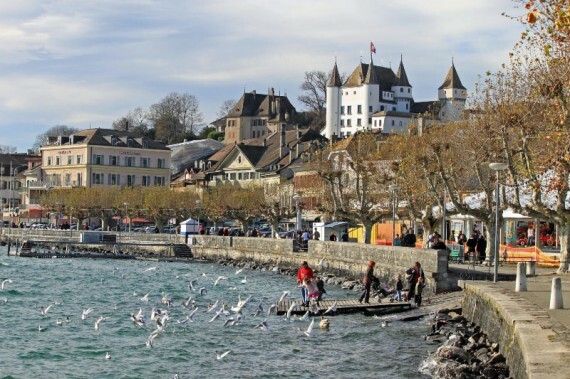 See Top Sights to See in Nyon for more details on this lovely town and the white castle. Yvoire is directly across Lac Léman from Nyon in France. This French town preserved its picturesque medieval look and is a very popular day-trip destination from Geneva and Lausanne. Ferries from Nyon to Yvoire generally provide the best transportation options to Yvoire. The Chateau d’Yvoire guards access to Yvoire from Lake Geneva and often can be seen from the Swiss side of the lake. Unlike the welcoming town of Yvoire, the castle is in private hands and not open to the public. The unpretentious Chateau de Rolle every bit looks the military fortress with thick, undecorated walls. The castle is used as administrative offices and is not generally open to the public for sightseeing purposes. However, it is possible to stroll into the courtyard during office hours and look around. The Chateau de Rolle is directly on the waterfront of Rolle. Visitors can stroll on this generally quiet paved promenade from the castle to the yacht harbor. Play areas for children are available along the way with the best play park directly behind the castle on the lakefront. The Chateau de Morges is also every bit the military fortress – part of it is still being used by the Swiss army. 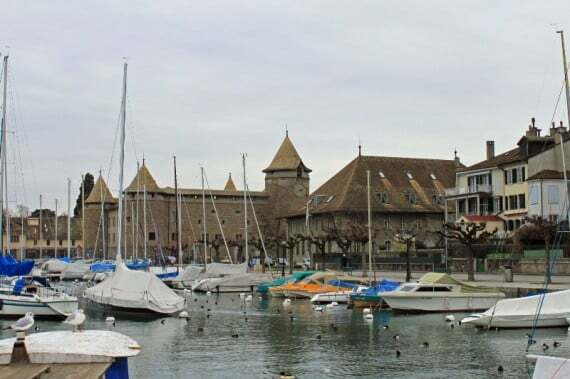 The Chateau de Morges is behind the yacht harbor and next to the Parc de l’Indépendance (Independence Park), which is often used for special events including the annual tulip festival in spring and the Swiss British Classic Car show in early October. 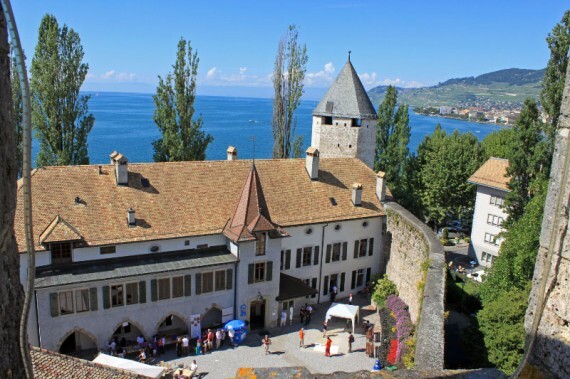 The Chateau de Morges houses four museums: the Vaud Military Museum, the Swiss Museum of Historical Tin Figures, the Artillery Museum and the Museum of the Vaud Gendarmerie. All these museums are covered by a single admission ticket and surprisingly easy to enjoy and fun for children as well. 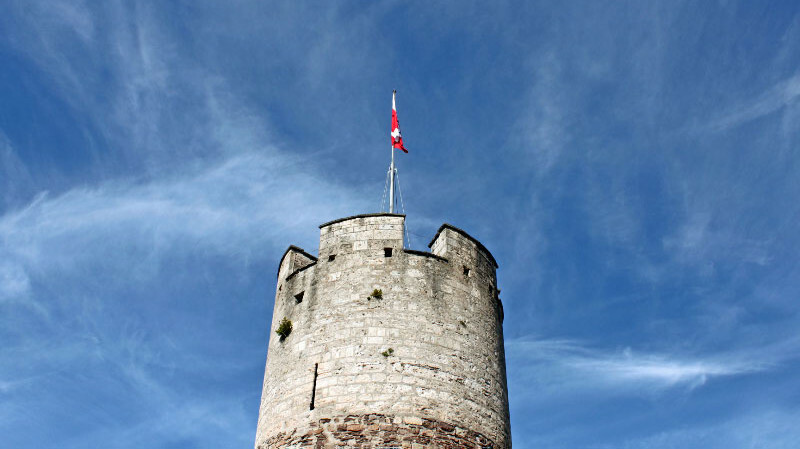 See Château de Morges for more on this historic castle and the four museum. The chateau in La Tour-de-Peilz is, as the name indicates, more famous for its tower than its castle. Visitors can enjoy breathtakingly beautiful views of Lake Geneva and the Alps from the top of the tower. In the chateau itself, visitors can visit the Swiss Museum of Games, which has a large collection of historical games from all parts of the world. Playing some games is allowed but most are safely behind glass. La Tour-de-Peilz is a small community to the south of Vevey. It is a very pleasant stroll from the center of Vevey along the lakeside promenade to the Swiss Museum of Games.